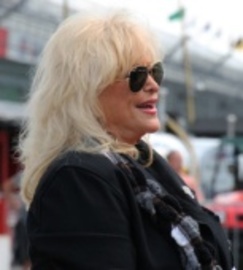 Linda Vaughn in Dalton, Georgia, United States is a motor racing personality who has been described as the "premminent beauty queen of stock car racing". Vaughn was named "Miss Queen of Speed at Atlanta International Raceway" aged 18 and has acquired many other titles since then. Vaughn has been a notable ambassador and promoter of various forms of American motor racing for several decades. She was chosen to be the queen of the 1961 Dixie 400. She appeared in the 1976 film The Gumball Rally. Her prominence in motorsports gained her an induction into the Diecast Hall of Fame in 2015, where she was recognized as an Automotive Legend.